Concordia’s alleys are an underutilized community asset according to Garlynn Woodsong, Chair, CNA Land Use & Transportation Committee (LUTC) and cleaning them up is the first step toward their revitalization. To that end 30 volunteers, mostly students from Concordia University, fanned out over the 120 alleys in the Concordia neighborhood and picked up trash and other debris on Sat., April 16. What they found wasn’t surprising. 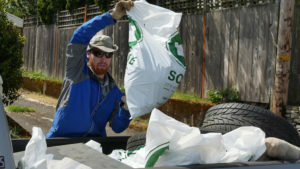 The alleys were littered with cardboard, paper, plastics and the occasional tire. Some of the alleys were blocked wit h mud, blackberry vines and laurel bushes making passage by impossible. 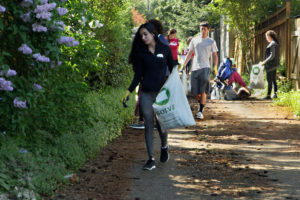 “Once we pick up these alleys people will see this sort of neglected space where they can walk their dog, or go for a walk with their kids, or maybe imagine planting some flowers and improving the muddy surface with permeable pavers or just new load of gravel.” said Woodsong. Concordia residents interested in alleys or any other issue related to land use and transportation are invited to attend the Concordia Neighborhood Association Land Use and Transportation Committee (CNA LUTC) meetings at 7p.m. on the third Wednesday of the month, in the Community Room in the SE corner of McMenamins Kennedy School. Click here to join the LUTC mailing list.